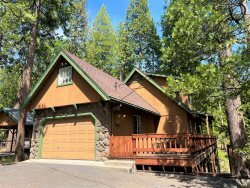 Dogwood Cabin - A charming Twain Harte cabin with an easy five minute walk to town, yet encompassed by trees for privacy. Now with WiFi! Twain Harte charm and extreme hospitality! An easy five minute walk to town yet surrounded with trees and privacy! Two Story, 3 Bdrms, 2 Bath **Now with WiFi!! ** Five easy stairs to the front door to enter the main floor and spacious living room with high-beam knotty pine ceiling, piano, flat screen TV, two long sofas, a Queen hide-a-bed and a game/dining table with seating for 4. To the left of the entry, enjoy the fully equipped country kitchen with table seating for 8. Ahead on the main floor; 2 bedrooms, one with a King Bed, the other with a Double Futon and Bunk Beds; full bath with tub and shower; Rumpus Room with a bar/game area (foosball, roulette, cards, etc), a pub table, and a Double hide-a-bed. Upstairs; large hideaway suite with Queen Bed, Double Futon and full bathroom with shower only. Relax on the front porch and the 800 square foot childproof deck and enjoy a quiet wooded area for the ultimate in outdoor living spring through fall. Lots and lots of deck furniture! Downstairs off of the lower level patio make use of the washer/dryer, roll-away beds, beach chairs, high chair, Whirl-ball, Basketball hoop, ping pong, and horseshoe pit out back! Parking for 3-4 cars.